Isn’t it true that you can optimize any content using the right marketing tactics? A good salesperson can sell anything, right? Well, no. It’s counterproductive to try and push your content onto readers when you could be producing content that draws people to you in the first place. Your promotion efforts (ads, social media, web optimization) should complement your content, not the other way around. If you’re looking to increase your audience, you should aim to produce content that people want to consume. Rome wasn’t built in a day and neither were online communities. Finding an audience takes time and the web is saturated with competition. How do you make your blog stand out? First, take a look at what’s being produced right now. You don’t necessarily have to revolutionize the online world. It’s okay to write about common topics such as technology, fitness, travel or beauty. But think about what you could do differently. Look at other blogs in your category, how would you improve them? Offer your readers new perspectives. Even when producing content with your audience in mind, make sure to maintain an authentic voice in your writing. After all, it’s your blog and people respond positively to candidness. Don’t be afraid to show your personality. If your audience feels like they can relate to you, they will trust your opinions and are more likely to become loyal readers. Separate one day a week (or an hour of each day) for creating visual content. Setting up your camera takes time, so why not produce as much content as you can in one go? Going out to eat? Take a full body picture, you got a fashion post. Photograph your makeup: beauty review. Take photos/videos of your food at the restaurant: travel or food article. You get the idea. After you’re done editing and curating your pictures, upload them all into your platform as drafts. Uploading photos can be time consuming so it’s best to do it all at once. Separate a different day for content writing. A quick way of generating content without spending hours on writing and photography is doing it on the go. DSLR cameras are bulky, expensive, and the setup is time consuming. Why not use your phone or tablet instead? They’re easier to use and yield high resolution photos than can be uploaded onto social media with just a few taps. Besides taking photos, you can use your devices to synch your calendars and answer messages. These will quickly multiply as your blog grows. Best of all, you can write drafts and publish content sporadically on your free time (like during your daily commute). 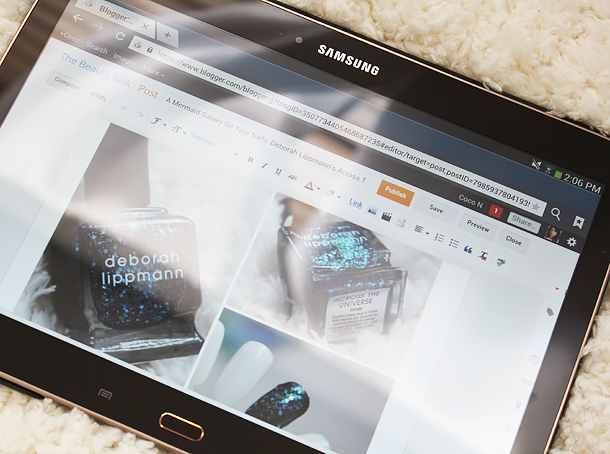 I like to use my Samsung Galaxy Tab 3 to write my posts on the go. A tablet is a travel-friendly tool that can optimize your blogging process. Remember, inspiration can strike anywhere. I hope you found these tips helpful. If you have any other blogging advice you would like to add, please share it in the comments below. And thank you #IntelTablets for asking me to be a part of the #TabletCrew! #spon: Intel disclosure. I’m required to disclose a relationship between our site and Intel. This could include the Intel Corporation providing us w/content, product, access or other forms of payment. I received this tablet for free as a PR sample in exchange of a blogpost but I’m not getting compensated to write it nor am I sponsored by Intel. Thank you so much! This is such a helpful post. I don't have a tablet yet but I'm saving money to get one. It'll definitely be a lot more convenient and I'll be able to improve my blog! I've never though to use my iPad for blog photos – probably a good idea because my bridge camera isn't that good anyway! these are great tips.. I already do some of them i try at least have more than 2 blogs in drafts. So i can publish them when needed too. This was very inspiring and you had some great tips. I think im on the right track, i have about 15 drafts ready to go. Thanks! Thanks for the tips! My biggest SEO concern is when using Flickr, it changes the file name.. So I use tags instead, which helps a little..
Great tips. Especially the second one is really helpful. Thanks! This post was incredibly helpful! Thank you! I'm still struggling to get traffic onto my blog 🙁 any advice on that? I've loved your advice'm usually very busy and always take photographs for my blog on Saturdays from early to have the rest of the day to do other things. I think the most important tip is to have fun doing every thing on the blog. If you're not having fun then all the work isn't worth it, agreed. Haha, yeah! I tried it once, so uncomfortable. Amazing post!! Very informative for us newbies.